Pearl HDMI embodies all of AudioQuest’s core philosophies on cable design. It employs solid Long-Grain Copper conductors, Solid High-Density Polyethylene Insulation, and precise geometry. 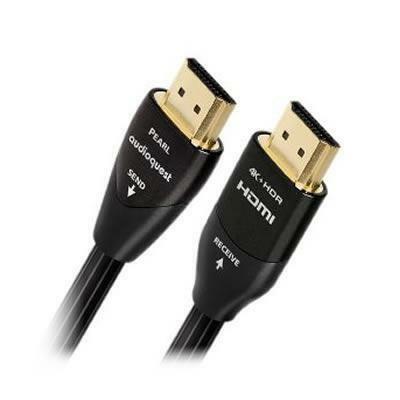 Specific attention has been paid to maximizing the performance of HDMI, and indeed, AudioQuest’s HDMI cables push sonic performance to new levels. Thomas TV is located in Welland, Ontario - proudly serving the Niagara region for over 54 years, family owned and operated. We carry a vast selection of brands such as Panasonic, Samsung, Yamaha, Focal, PSB, Arcam, Revel, Harman Kardon, Project Turntables, Cambridge Audio, Audioquest, and more. We are committed to providing our customers with the best service, best brand selection and the best prices for consumer electronics. Our fine reputation comes from knowledgeable and courteous staff, that have you, the customer in mind. We are a member of one of the largest independent buying groups in Canada so as to provide you with the widest selection of quality products at competitive prices. © 2019 Thomas TV All Right Reserved.